Investors look at computer screens showing stock information at a brokerage house in Shanghai, China, July 8, 2015. 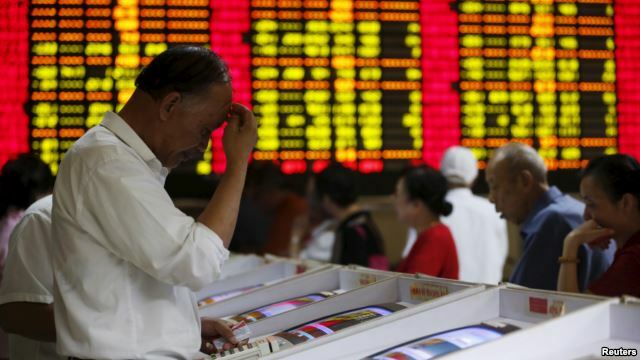 China's stock markets have lost nearly $3 trillion from their peak in June. As a result, the government has introduced new measures hoping to stop weeks of declining prices. In an effort to avoid further losses, hundreds of companies listed on China's stock exchanges filed papers to suspend trading. By Thursday, the stocks of more than 1,400 mainland companies had been suspended. That is about 40 percent of the market. China's Securities Regulatory Commission blamed the losses partly on a "panic sentiment" and "irrational selling." Chinese state media have blamed short-sellers, traders who profit from falling prices, people spreading rumors and foreign investors. The government then put in place a number of measures to calm the stock markets. The government agency that oversees the country's biggest state-run companies has told them not to sell shares. Instead, it told them to buy more to keep the market stable. The country's central bank promised to "offer (an) abundant liquidity supply for security brokers." That means it would make loans to stock traders, called brokers, to make sure they have enough money to carry out trades. Chinese officials also have lent $42 billion to brokerages to buy shares. And the government moved to permit insurance companies to invest larger amounts of money in stocks. China's stock markets rose in late 2014 after the central bank cut interest rates for the first time in more than two years. A new trading link between the Shanghai and Hong Kong stock exchanges added to increased market activity. Higher "margin trading," in which investors do not have to deposit the full cost of their stock trades in order to buy the shares, also fueled gains. In the twelve months before June 12 of this year, the total value of stocks traded on the Chinese market increased by more than 150 percent. But as the market peaked in early June, the government tightened rules on margin trading. Investors then began to sell their holdings to protect their profits. U.S. Treasury Secretary Jack Lew spoke about China's answer to its stock market problems at the Brookings Institution in Washington last week. 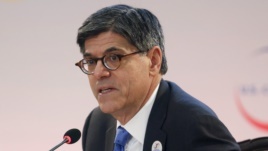 Treasury Secretary Jack Lew speaks at the U.S.-China Strategic and Economic Dialogue in Washington in June. He said China's markets are not fully integrated into the world financial system. Mr. Lew says Chinese officials have a strong commitment to market reforms where they have clearly set out a plan. He said the speed at which the reforms are put in place remains a question. "The question isn't their commitment to the goal. The question is the pace at which they implement it and do they do it fast enough for it to be effective. I hope this is not something that slows down the pace of reform…They've got a set of policies that they've outlined which, if they implement them, I think will make China's economy much stronger in the future." Mr. Lew said China is moving from a centralized, industrial economy to a more market-based economy powered by consumer spending. This, he said, would lead to slower more sustainable growth and improve the lives of the Chinese people while lifting the world economy. He warned of slowing the reform process. "If the reaction is to put the brakes on reforms, that will slow that process." Investors welcomed the government actions to stop the decline. On Friday, Chinese stock markets regained some of the losses from the past few weeks. However, stocks from many Chinese companies are still suspended from trading. Other investors believe prices may fall again once the suspended shares resume trading. In a report on Friday, Bank of America wrote that the stock market crash would hit the Chinese economy in time and "will likely hurt consumption down the road." VOA's Ken Bredemeir, Steve Herman, Saibal Dasgupta, Joyce Huang and Victor Beattie reported this story. Mario Ritter adapted their reports into VOA Learning English. Hai Do was the editor.